Milngavie Music Club’s pre-Christmas concert combines classical music with comedy in a family show that will delight music lovers young and old. ‘Christmas Crackers’ features The Classic Buskers - a duo who first came to prominence as The Cambridge Buskers at the Edinburgh Fringe, on radio and television and round the world. These two incredible musicians - Michael Copley who plays over 40 woodwind instruments at amazing speeds, from recorders, flutes, panpipes, crumhorns and ocarinas to a Pico Pipe and a rubber trout, and Ian Moore who plays accordion, either pink or yellow. It’s on Friday, December 12 at 7.30pm in Cairns Church. 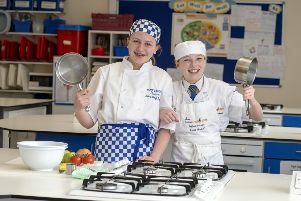 Adults - £12, students - £5, school children free, From: The Iron Chef or Milngavie Bookshop or venue on the night.